Happy Humpday my friends! Today I’m sharing a few photos of our new headboard and some of my favorite bedroom essentials. First of all, let’s talk about this gorgeous headboard by Tufted Frog. About 3 years ago, I stumbled upon Tufted Frog on Etsy and immediately fell in love with their headboards. Essentially, you can order a custom-made headboard based off of your specifications. You can choose the shape, size, fabric, and any extra detailing (hardware, studs, buttons, etc.). The owner, Hollie, is amazing and super talented. She works with you to design your headboard, and then makes it herself, and mails it out to you. They’re super light weight and easy to hang (like a picture frame). You can see photos of my first Tufted Frog headboard here. I had our lovely grey headboard for a couple years in Indy, and then we moved it out to LA where we used it for a year, and then we moved back to Indy. It’s still in amazing condition after being moved across the country twice! Now that we have a guest bedroom, I decided it was time for another headboard. I sent Hollie some inspiration photos and we landed on this design- I’m thrilled with how it turned out! Now we have a gorgeous teal headboard for our room and the grey headboard for our guest room. As a side note, we went with the same shape, size, and design for both of our headboards. We loved our first one so much that we only changed up the color when designing the our second headboard- but the options are truly endless! There are so many other designs you can choose from. 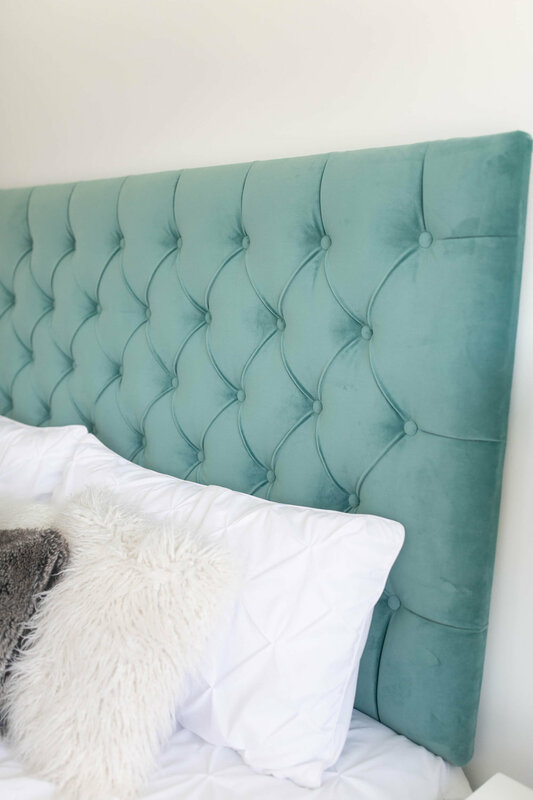 I truly cannot say enough great things about Tufted Frog and I highly recommend them if you’re looking for an amazing quality headboard at an affordable price! I think I have the most comfortable bedding in the world. I’m obsessed with my Bluebird sheets that I’ve been using for the past few months. They’re incredibly soft and lightweight and they wash very well. You can find my comforter here- it’s super affordable and soft! Now, let’s talk about a few of my bedtime essentials. I absolutely love unwinding at the end of my day which is why I’ve started taking my bedtime routine very seriously! I’ve been using lots of essential oils and they help me feel so relaxed and truly help me fall asleep faster. Here are a few of my favorites! I started using Saje in January and I’m absolutely hooked. Their whole mission is to introduce people the power of 100% natural, plant-derived wellness products. Saje offers natural skin care, body care, home products, and essential oils. I use their Pocket Farmacy every night and I highly recommend it if you’re just starting out with essential oils. My favorites are Stress Release and Pain Release. I also use my Saje diffuser with a few drops of Yoga or Unwind oil. I got hooked on the This Works pillow spray about a year ago. I spray it on my pillow every night before I go to bed and I swear by it. This Works creates products that work with your natural circadian rhythm to support better sleep, better skin, and better overall wellness. They did a study with the pillow sprays and found that 89% of people fell asleep faster than normal, 96% of people had less disturbed sleep. PS none of this is sponsored, I’m just obsessed and felt inclined to share!! I also love their Stress Check oil- I use it morning and night! Weekly outfit recap including best sellers and outfits from the week! Thank you! We just sent you an email confirmation- be sure to click confirm!